AP AGRICET 2019 Hall tickets, BSc Agriculture Entrance Test 2019 Hall tickets, Acharya N.G. 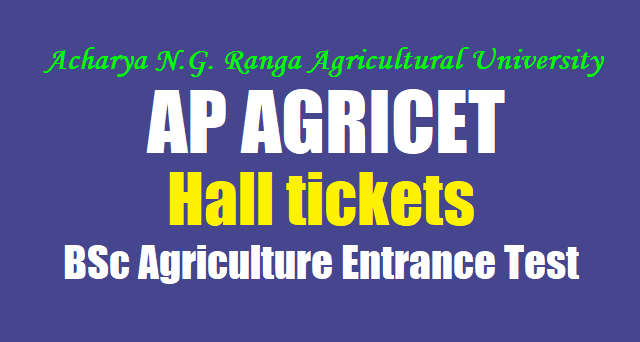 Ranga AGRICET 2019 Hall tickets for BSc Agriculture Course Admissions 2019-18/ BSc Agriculture Entrance Test 2019 Hall tickets for Agriculture and Seed Technology Admissions 2019: Acharya N.G. Ranga Agricultural University, Hyderabad has issued the Andhra Pradesh ANGRAU AGRICET 2019 Notification in May 2019. Acharya N.G. Ranga Agricultural University invites applications from Diploma holders in Agriculture and Seed Technology for admission into four years B.Sc. (Ag.) Degree programme through AGRICET 2019 for the academic year 2019 -20. The University Officials invited the applications in the prescribed form from 25-05-2019 to 24-06-2019 from the eligible Diploma holders in Agriculture and Seed Technology for admission into (4)four years B.Sc. (Ag.) Degree Programme for the academic year 2019 -18. The candidates, who were passed in Agriculture / Seed Technology Diploma Courses from ANGRAU were applied for this entrance test stream through offline mode and they can get the hall tickets from the officials at the time of application submission process. Candidates can also download the hall tickets from the official website. The entrance test would be conducted on 29-07-2019 by 10.00 AM to 11.30 AM at notified test centers. Acharya NG Ranga University Officials will give the hall tickets of AGRICET 2019 after completion of application submission process OR at the time of submission process. For more details available on official website : http://www.angrau.ac.in/. 1. The list of eligible candidates along with the hall ticket numbers will be displayed in the University website on ...-2019 those candidates who have not received the hall tickets can however download the Hall Ticket from the University website and attend the Test.